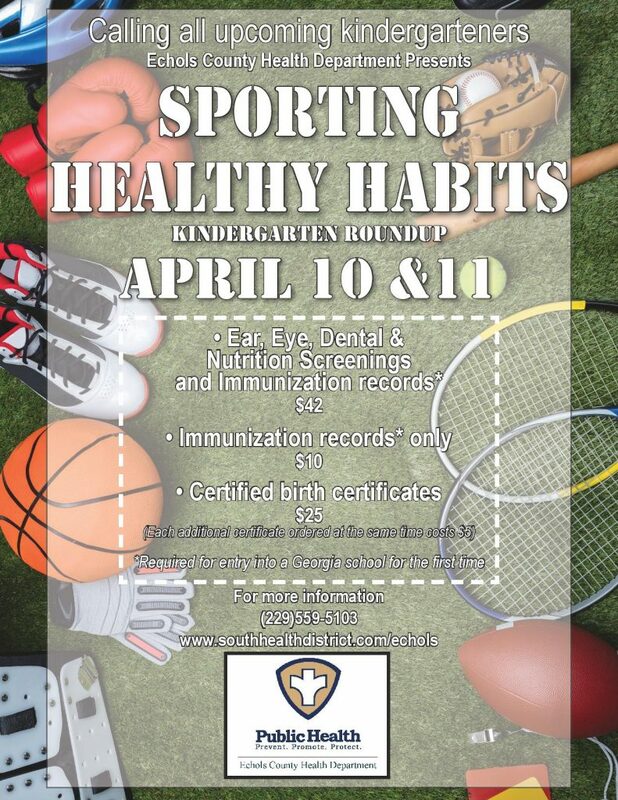 The health department will be holding a “Sporting Healthy Habits” kindergarten roundup on April 10-11. They will be offering Ear, Eye, Dental & Nutrition Screenings for $42. That price includes immunization records. Immunization records alone are $10. Both are required for entry into a Georgia school for the first time. Medicaid and some private insurances will be accepted. Co-pays are required. “We want everyone to kick off the coming school year the right way and not wait until summer to prepare,” said Leigh Ann Combass, RN, Echols County Nurse Manager. The Health Department also offers certified birth certificates for $25. Each additional certificate ordered at the same time costs $5. For more information call (229)559-5103 or visit www.southhealthdistrict.com/echols.